I've lived here so many years that Germany is home to me. When you feel at home, you tend not to notice your surroundings anymore. But every now and then, something reminds me things aren't the same in the US. Here are some simple things I love here in Germany. I live in the area known as Franconia, where it's a tradition to decorate fountains and bushes for Easter. 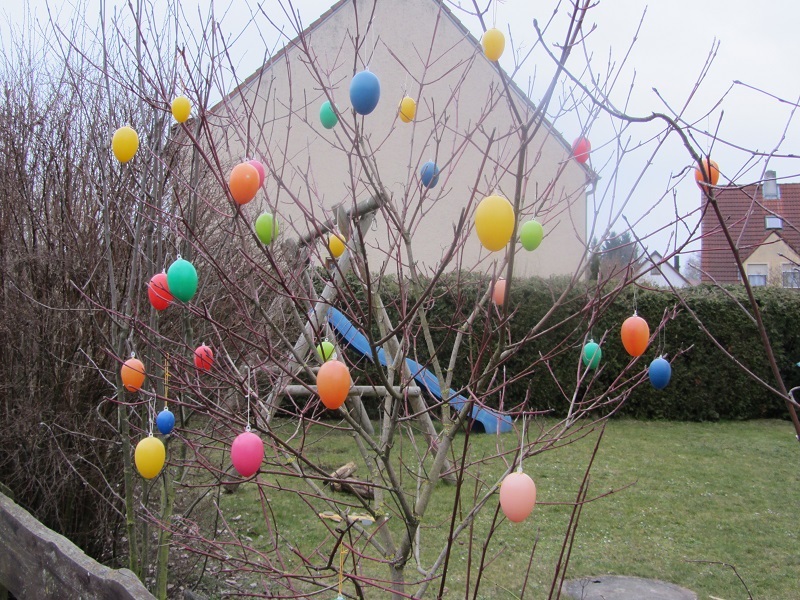 Here's our Easter bush. I'm a wimp when it comes to crafts, so I use plastic eggs. Some go for gold and blow real eggs out, dry them, then paint the empty shells and use them for decoration. At the beginning of Spring, when the weather is often drab, perky eggs flashing from everyone's yard can be a real pick-me-up. The best thing about most of these cakes (no, unfortunately they are not calorie-free) is that they are not very sweet. Some might look like they're piled high with sugary-sweet frosting, but it's actually yoghurt-based or whipped cream. Real whipped cream, made (logically) by whipping real cream. It's kind of a stereotype that Germans are organized. Stereotypes are often fact-based, and here's one I love. 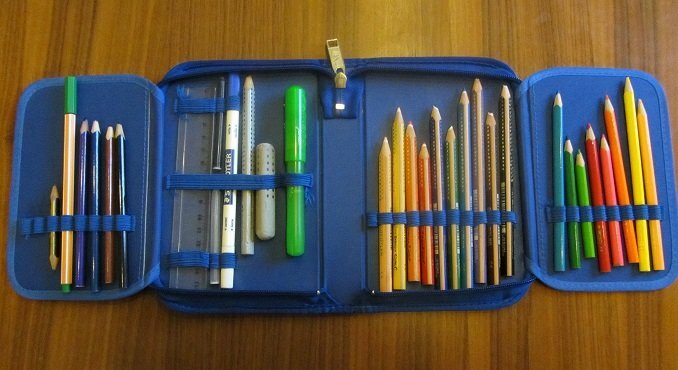 Example: every child in my daughter's second grade class has one of these "folders" for organizing pens, pencils, rulers, erasers and scissors. We have six kinds of garbage: paper, biodegradable, tin cans, glass, plastics, and everything else. All but the last category are recycled, at least to a certain degree. No picture here. Didn't think you needed to see our garbage. Watch this space—I'll probably be inspired to write more about things I love about Germany. Some of my readers live in Germany. So how about you? What are some everyday things you love?